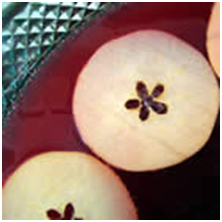 1.In a large punch bowl, combine apple juice, cranberry juice concentrate and orange juice. Stir until dissolved, then slowly pour in the ginger ale. 2.Thinly slice the apple vertically, forming whole apple slices. Float apple slices on top of punch.